We’ve all been there: You threw an amazing party—maybe a housewarming, maybe a holiday get-together — but now it’s 1, 2 AM, and your guests just. Won’t. Leave. It’s not your fault you’re just that good at throwing parties, but you’d also like to clean up and head to bed sometime soon. What is one to do? Don’t worry — Special Counsel Robert Mueller has a little party hack you can use next time, as we learned in a profile in Time magazine’s 2018 Person of the Year issue, in which the former FBI Director is a runner-up. You see, he’s not just the man overseeing the investigation into whether or not the President of the United States knew that Russia was meddling in our 2016 election, he’s also a person. A person who likes to cut loose every now and then but has little time, it appears, for arbitrary social pleasantries. Relentless but circumspect. Impatient but thorough. Difficult but respected. 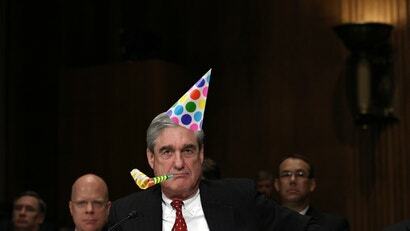 Rather than wait around for people to finally get the hell out of his house or make passive aggressive comments to those lingering well after everyone has left — the worst part of throwing a party — Mueller flicks the lights on and off to signal it is time to go. There’s no guessing here, no opportunity to misinterpret. It’s simple, elegant. Harsh and to the point! Now, had Joel invited me, I’m fairly certain I would have caught on to what he was doing and been the first to exit, thus ensuring other guests would follow my lead and leave Joel to enjoy the rest of his evening. You can ask any of my friends — I love to leave a party early! But he didn’t. And I’m fine with that! Really. I’m fine. But next time he should either 1) Invite me (Only if he wants to! No pressure! ), or 2) Flick the lights on and off, like ol’ Mueller here. Anyway, Tech Editor David Murphy says he’s tried the pajama trick and claims that it worked. So I suppose it is a possibility. Health Editor Beth Skwarecki’s party-ender is the most brutal and efficient of all, as is her wont. “You can just kill whichever circuit breakers power the music and lights,” she says. “They can sit in the dark with you in your pajamas, or they can go home.” Good point, Beth — I’d go home!